Forks, Knives, and Spoons is a great novel about 2 girls starting their freshman year at Syracuse University in New York. Before Amy York heads off to college, her father tells her about the Utensil Classification System (UCS) and how all guys are either forks, knives or spoons. When Amy arrives in her dorm and meets her roommate Veronica, she tells Veronica all about the UCS. Veronica has her doubts about the merits of the UCS, but all throughout their years in college, Amy rates each guy by the UCS. 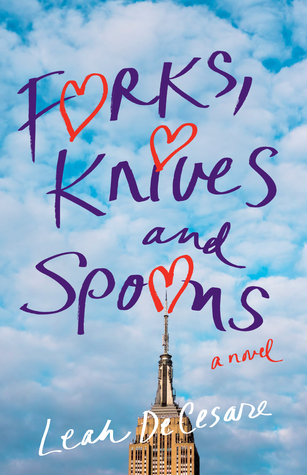 Forks, Knives, and Spoons follows Amy and Veronica through college and on to NYC where they begin their careers. It's a great story about friendship, girl power, and a little bit of romance too. But I think the main theme of the book is how Amy and Veronica learn how to become strong, independent women. Whether it be family issues or boyfriend issues, they both have things to learn about themselves. I love that this novel takes place in the 80's. The music and fashion references were a great trip down memory lane for me. It was also refreshing to have a story take place before cell phones and social media. I also loved the part that letters and postcards played in the book. One of my favorite parts of the book is that both Veronica and Amy were able to figure out what was best for them and their relationships in the end. Sometimes it's hard to make those decisions but it made me happy for both of them. This is a great summer beach read...and that's exactly where I read this! There are three kinds of guys: forks, knives, and spoons. That is the final lesson that Amy York's father sends her off to college with, never suspecting just how far his daughter will take it. Clinging to the Utensil Classification System as her guide, Amy tries to convince her skeptical roommate, Veronica Warren, of its usefulness as they navigate the heartbreaks and soul mates of college and beyond. Beginning in 1988, their freshman year at Syracuse University, Amy and Veronica meet an assortment of guys from slotted spoons and shrimp forks to butter knives and sporks all while trying to learn if the UCS holds true. On the quest to find their perfect steak knives, they learn to believe in themselves and not to settle in love or life.